February 28 is a great day for chocolate lovers. 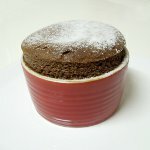 This is National Chocolate Soufflé Day, the day that celebrates a delightfully tasty treat. The first recipe of soufflé, supposedly, appeared in French cookbook by Vincent La Chapelle Le Cuisinier Moderne in 1742. By 1845 this recipe was so commonly accepted, that a recipe for soufflé in Eliza Acton's Modern Cookery was included as just “another” recipe. Today everyone loves puffed up soufflé for its divine taste and simplicity to make. Chocolate soufflé has got only two basic components that make it so soft: French cream sauce or puree and egg whites beaten to soft peaks. The base provides flavor, and egg whites provide texture. Freshly baked soufflé is fluffy and puffy, but in about 10 minutes it deflates a little. This is natural process and you can't do anything about it. Just don't let this tendency to collapse disappoint you and don't think about sitcoms and movies hijinks. The dessert will have a great taste, so you can enjoy it with your family and friends.